A leader in the Democratic Party is a boss, in the Republican Party he is a leader. All the president is, is a glorified public relations man who spends his time flattering, kissing, and kicking people to get them to do what they are supposed to do anyway. Most of the problems a President has to face have their roots in the past. This is a Christian nation. I never did give them hell. I just told the truth, and they thought it was hell. The President of the United States hears a hundred voices telling him that he is the greatest man in the world. He must listen carefully to hear the one voice that tells him he's not. There is nothing new in the world except the history you do not know. No one who has not had the responsibility can really understand what it is like to be President, not even his closest aides or members of his immediate family. There is no end to the chain of responsibility that binds him, and he is never allowed to forget that he is President. I sit here all day trying to persuade people to do the things they ought to have the sense to do without my persuading them. That's all the powers of the President amount to. A President cannot always be popular. When you get to be President, there are all those things, the honors, the twenty-one gun salutes, all those things. You have to remember it isn't for you. It's for the Presidency. I would rather have peace in the world than be President. A President either is constantly on top of events or, if he hesitates, events will soon be on top of him. I never felt that I could let up for a single moment. Carry the battle to them. Don't let them bring it to you. Put them on the defensive. And don't ever apologize for anything. The Marine Corps is the Navy's police force and as long as I am President that is what it will remain. They have a propaganda machine that is almost equal to Stalin's. Art is parasitic on life, just as criticism is parasitic on art. My father was not a failure. After all, he was the father of a president of the United States. 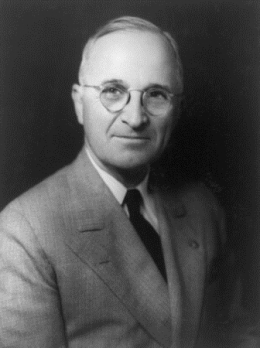 21 quotes by Harry S. Truman.